Almost time for me to go. Thank you for your company this evening and please join us again tomorrow for more live Scottish football coverage. A dramatic night at the Falkirk Stadium and it's the hosts who progress to the Premiership play-off final. "The character of this football club, this team - they're a fantastic bunch. We take chances, we took a chance tonight and Bob McHugh scores again - brilliant. I'll go to [Kilmarnock's] game [against Dundee United] tomorrow. We'll do our homework and we'll do our best." The last time Kilmarnock and Falkirk played, a 0-0 draw spared Killie relegation and sent the Bairns down to the second tier. Now, they will contest a two-legged tie (19 and 22 May) for a place in the Premiership. "To have lost the game in that manner, it's obviously a very quiet dressing room. We need to pick ourselves up [for the Scottish Cup final against Rangers]. They've sampled the cruellest way to lose a game. Next week, we have the chance to sample the highs. We've got a huge game next week." Vieira151: "Well done @falkirkbairns Dug deep like they have done so well all season long. Kilmarnock should be winnable, right? #bbcsportscot"
An incredible 180 minutes between Falkirk and Hibernian. Like their league meetings this season, so little separated the sides but it is the Bairns who got the all important goal. Hibs barely had time to kick-off again. 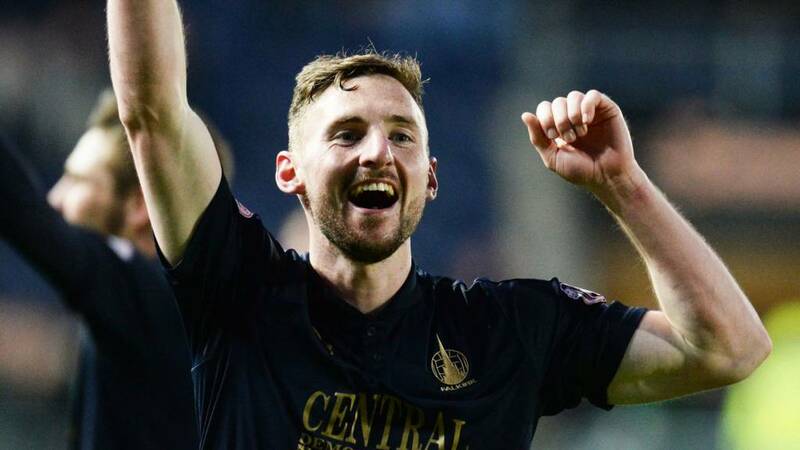 That late, late Bob McHugh goal carries Falkirk into the Premiership play-off final to play Kilmarnock over two legs. Scottish Cup finalists Hibernian are consigned to a third straight season in the Championship. Is that the winner?! A long throw-in into the Hibs penalty area is allowed to bounce and Bob McHugh batters the ball into the net via the post. Anthony Stokes' header clips the top of the Falkirk crossbar as Hibs threaten at a corner. Myles Hippolyte is booked for a late challenge on Hibs' David Gray. What an effort by Jason Cummings. The Hibs substitute picks the ball up fully 40 yards out (at least) and his left-foot strike rattles the crossbar. thesnowman21: "what a goal #bbcsportscot"
Lee Miller is brushed aside by Paul Hanlon and the Falkirk fans demand a penalty but they claim in vain. Change for Hibs. James Keatings makes way and top scorer Jason Cummings enters the fray.